"Secrets from the woman they call the TODDLER WHISPERER." Tovah P. Klein (“us”, “we”, or “our”) operates howtoddlersthrive.com (the “Site”). This page informs you of our policies regarding the collection, use and disclosure of Personal Information we receive from users of the Site. While using our Site, we may ask you to provide us with certain personally identifiable information that can be used to contact or identify you. Personally identifiable information may include, but is not limited to, your name, email address, postal address and phone number (“Personal Information”). Tovah P. Klein has no control over, and assumes no responsibility for, the content, privacy policies, or practices of any third party sites or services. 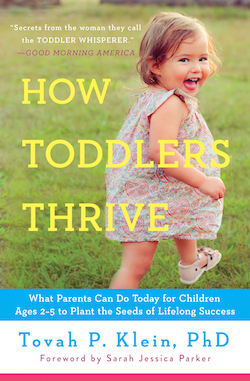 Listen to How Toddlers Thrive on Audible! "Secrets from the TODDLER WHISPERER." Do Your Kids Need a Screen Intervention? Tovah Klein, Ph.D. is a psychology professor and Director of the Barnard Center for Toddler Development in New York City. She appears regularly on national TV and has been called the “Toddler Whisperer” by Good Morning America. She was a developmental advisor to Sesame Workshop and is an educational advisor to international and national programs including Ubuntu Education Fund, Room to Grow and Children’s Museum of Manhattan.